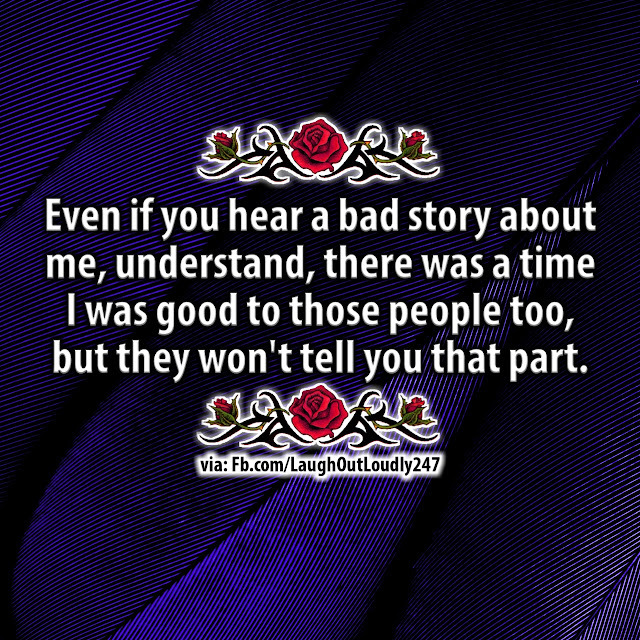 Even if you hear a bad story about me, understand, there was a time I was good to those people too, but they won't tell you that part. So true and keep your circle small 😉 you'll be much happier. It's true,they don't remember you've done them good,what they remember is you've done something wrong. Some people only remember when you didn’t give to them not when you gave and gave! Some people are only willing to tell others how you’ve hurt them, they will never tell what they’ve done to you! Thats life. People are only bad about others to feel good about themselves. Insecurity on their behalf. Keep others down it keeps them up. Leave these folk to their own devices, karma as a way of sorting such as this out. Judging and condeming others before you know them isnt my idea of nice, but im afraid it happens. I hear it every day. But i say dont be horrid until you know that person yourself.. judge for yourself. Because they keep on impressing others inspite of their wrong deeds. They are the legitimate twister of the truth who are always wearing mask wherever they go. For get them obviously you're more important are they wouldn't be talking about you cuz you're not talking about them. Be happy and be who you are picture/image is an Inspirational Stuff to Inspire and Motivate You. You can download pics by just clicking on the Images. Thanks for visiting Truth Follower an online place for huge collection of inspiring pictures, quotation, and Sayings Images. If you like Be happy and be who you are , Please Share with friends and family on Facebook, Twitter, and Pinterest.